Most chemists can't display samples of a compound that is named after them. So, in a way, I was a very fortunate wannabe chemist when I raided my piggy bank for a gleaming clump of pyrite - also known as fool's gold. Pyrite is a common mineral that is a compound of reduced, or electron-rich, forms of iron and sulfur. About the only thing that it has in common with gold is its color, and even that requires some gullibility. As far as minerals go, gold is soft and malleable. Its beautiful luster is extremely uniform and resistant to corrosion. Pyrite is almost as hard as quartz (the principal component of common glass) and it naturally forms a multi-faceted structure, often with indelible striations in color. It is easily oxidized to rusty goo and sulfur dioxide gas, which you get a whiff of every time to strike a match. 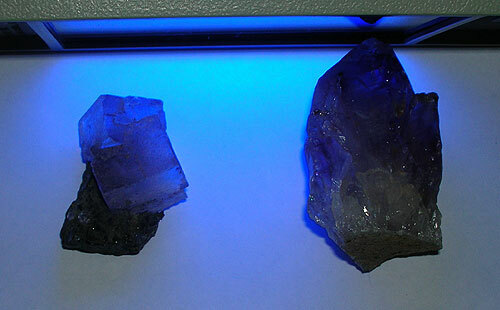 under ultraviolet light reveals the fake ID of fluorite. The similarities between amethyst and quartz, however, go beneath the surface hardness and the shape of the crystals. Both have the chemical composition of silica (one-part silicon and two-parts oxygen) but in amethyst, for every million silicon atoms, approximately 40 are replaced by iron atoms, and this makes the color purple. Ironically, the uniformity and depth of color, which increase the value of the gemstone, depend on the distribution of impurities. Fluorite can have the same beautiful purple color as amethyst, but the similarities end there. The color is due to impurities, yes, but they are europium atoms sparsely distributed among a lattice that has a 2:1 makeup of fluorine to calcium atoms. Fluorite is not as hard as amethyst, and it naturally forms cubic shapes. I wouldn't call fluorite "fool's amethyst" because both are beautiful minerals and are worthy of the thoughtful collector's attention. The name amethyst comes form the Greek word for "not intoxicated" and is tied to classical mythology involving the Greek god of wine. Dionysus poured his intoxicating beverage over a virgin, named Amethyst, after she had prayed to be turned into colorless stone to prevent ravaging by beasts in his forest. She remained stone-cold sober, but was now purple and made of stone. Or something like that. The details of who did what to whom and why are a little sketchy on Wikipedia, just as they often are the morning after a party hosted by college students on Greek row. And this is precisely the reason that a growing chorus of college presidents have borrowed Amethyst's name to identify their petition to reconsider the drinking age in the United States. Amethyst also inspired the traditional but foolish belief that wine goblets made of the mineral named after her would prevent intoxication. The Amethyst Initiative asks state and federal representatives to engage in a public debate about the far-reaching effects of allowing adults between the ages of 18 and 21 to vote and serve in the military, but not to consume alcoholic beverages. Groups such as Mothers Against Drunk Driving have reacted forcefully against this initiative. Critics of this initiative often use the word "foolish". As a result, some college presidents, particularly in areas where temperance laws still exist, have withdrawn their names from the petition. While raising the drinking age has probably resulted in fewer alcohol-related traffic fatalities among young adults, so has sharply raising the price of gas. My point is that there are many factors at play, and changing one can have unintended consequences on many. Unintended consequences, far greater than any frenzied madness unleashed by Dionysus, were what led Congress to overwhelmingly approve the 21st amendment to the United States Constitution, repealing the Eighteenth and ending the so-called Prohibition era. Interestingly, and to be filed under "some things never change", politicians of the day anticipated that grassroots efforts would make it difficult to ratify the repeal of Prohibition by the usual, and sober, process of votes in state legislatures. Instead, they opted for state conventions. Political conventions aren't quite frat parties, but they aren't church picnics either. On the surface, the military-at-18-but-alcohol-at-21 rule strikes me as fundamentally un-American, and not altogether different from the "three-fifths compromise" between North and South that was originally written into the Constitution. Also to be filed under some things never change, if we don't consider all the factors, and think things all the way through, we're sure to be fooled again.